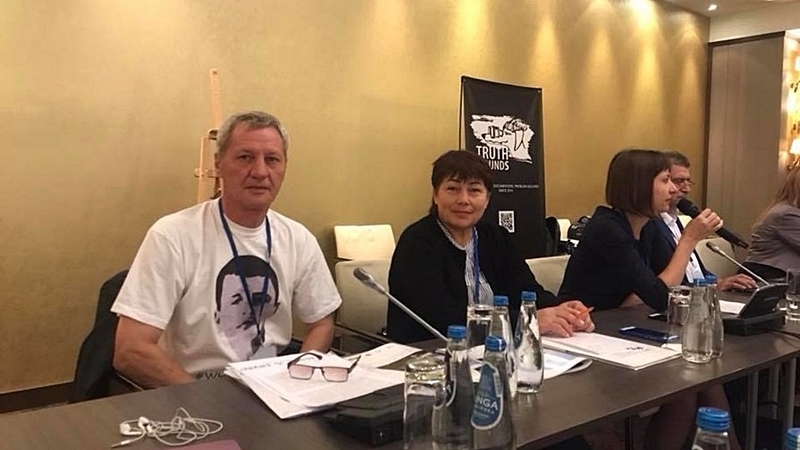 Relatives of Ukrainian political prisoners took part in the OSCE Human Dimension Conference in Warsaw (Poland) and talked about the crimes of the Russian Federation in the occupied Crimea today, September 13, according to the information on the website of the public organization CrimeaSOS. Aliye Degermendzhi, wife of a Crimean Tatar involved in the "Vedzhie Kashka case" and the mother of the person involved in the "case of February 26", as well as Umer Ibragimov, the father of Ervin Ibragimov who was kidnapped in the annexed peninsula, participated in the round table "Violation of human rights and international crimes in the Crimea". “In 2015 my son was arrested, in 2017 - they took my husband. All the charges against them are fabricated and false. We came here to say not only about our pain, we are talking about the pain of the entire Crimean Tatar people. Men who are currently in jail are very sick. Therefore, we are asking you to help us find a solution to this problem," Aliye Degermendzhi said. Father of Ervin Ibragimov asked the OSCE to help find his son who was kidnapped in the Crimea in 2016. Earlier, the speech of Russian propagandists in the Crimea was blocked at the OSCE conference. When one of the representatives of the Russian delegation introduced himself from the rostrum saying "Republic of Crimea, Russia", his microphone was turned off.